Park Cities Pet Sitter Collected Over $1400 in Pet Supplies and Donations During Their 5th Annual “Stuff the SUV” Event Benefiting Take Me Home Pet Rescue. More Than 300lbs of Dog and Cat Food Was Donated, Along with Countless Toys, Collars and Leashes. On Saturday, September 30th, 2017, Park Cities Pet Sitter filled a brand new 2018 Infiniti QX80 SUV with donated pet supplies for local Richardson non-profit organization, Take Me Home Pet Rescue. The SUV was donated for the day by Sewell Infiniti of Dallas, and was decorated with numerous balloons to get the attention of drivers and shoppers passing by the Pet Supplies Plus store at 200 N. Coit Road in Richardson, where the event took place. Numerous adoptable dogs from Take Me Hope Pet Rescue were on hand at the site of the event, along with volunteers from the rescue to answer any questions. Park Cities Pet Sitter staff solicited donations from shoppers and passersby, and would honk the horn of the Sewell SUV every time a donation was placed into the vehicle. After 5-hours, they had gathered over 300lbs of dry food, 200 cans wet food, dozens of collars and leashes, as well as pet toys, cash and gift cards—all to be used by Take Me Home Pet Rescue volunteers and foster families. Take Me Home Pet Rescue was founded in 2008 as a non-profit rescue organization committed to reducing the homeless pet population. All rescued dogs and cats in their care are sterilized, microchipped and given necessary medical care prior to being adopted out. Rescued pets under Take Me Home Pet Rescue’s care live in foster homes until they find their very own forever homes. TMHPR is a 501c3 organization and relies 100% on donations to fund their efforts. To learn more about Take Me Home Pet Rescue, visit http://www.TMHPR.com. 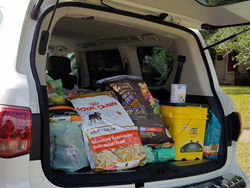 Park Cities Pet Sitter’s “Stuff the SUV” event kicked off their 5-week pet supply drive, which is part of the National Association of Professional Pet Sitter’s national Presents 4 Pets program. Donations for Take Me Home Pet Rescue will be accepted by Park Cities Pet Sitter through October 31st. Donations may be dropped off at the PCPSI offices Monday through Friday from 10am-4pm at 5831 McCommas Blvd in Dallas, or can be picked up by a Park Cities Pet Sitter staff member during any regularly scheduled pet sitting visit through the end of October. About Park Cities Pet Sitter: PCPSI has served the Dallas/Plano areas 7 days a week, 365 days a year since 1992, and was recently named the 2017 Business of the Year by the National Association of Professional Pet Sitters. Pet sitting,daily dog walks, pet taxis, overnight sitting, pet supply shopping, litter box cleaning and dog training are all part of the services PCPSI offers. Park Cities Pet Sitter is bonded and insured, and all sitters are employees--not independent contractors. A manager is on-call 24 hours a day to handle any emergencies. Go to http://www.pcpsi.com to learn more.